852242 SpongeBob Space Magnet Set is a SpongeBob SquarePants magnet set released in 2008. 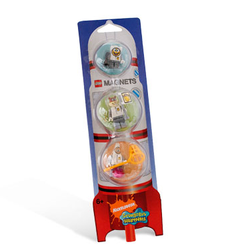 It contains three magnetic minifigures being SpongeBob SquarePants, Sandy Cheeks and Patrick, all in their spacesuits. Facts about "852242 SpongeBob Space Magnet Set"
This page was last edited on 9 January 2016, at 23:48.